If there is one thing from the Harry Potter universe that I would give anything to try (except for, you know, doing magic) would be to eat a meal prepared by Molly Weasley. Whenever Mrs. Weasley was around, there was sure to be some delicious homemade treats to snack on. Cooking breakfast for her family is a common occurrence throughout the books, and she always made sure to give Harry an extra helping of everything. 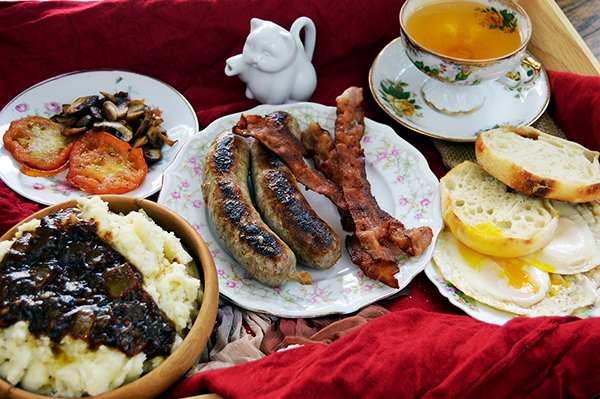 This breakfast was inspired by the second Harry Potter book, Harry Potter and the Chamber of Secrets, when Ron, Fred, and George break Harry free from the Dursleys. When they arrive back at the Burrow in the middle of the night, the boys are confronted by a wide awake Mrs. Weasley, who scolds her children for stealing their flying car. Molly appears to be conflicted on her feelings towards her sons doing something obviously dangerous and her delight with Harry showing up and begins cooking a full breakfast. I’d also like to think Mrs. Weasley prepared a similar breakfast for Mr. Weasley and served it to him in bed after he was attacked by Nagini while guarding the Department of Mysteries. 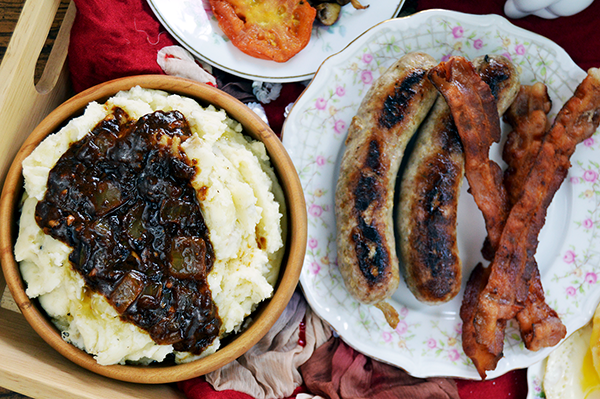 Bangers and mash is another traditional English breakfast, but it wouldn’t be a Weasley meal without copious amounts of other delicious breakfast foods served alongside. 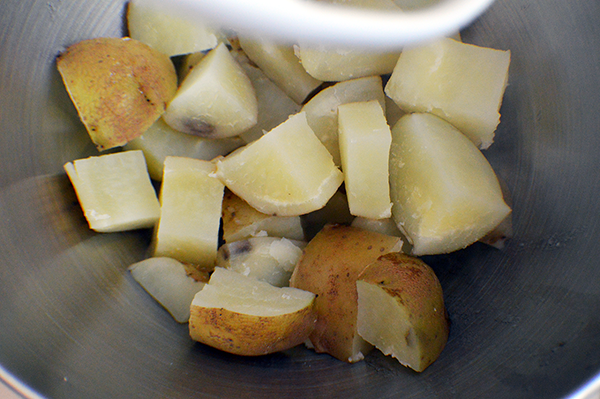 Start by chopping the potatoes into cubes and cover with a few inches of water in a large pot. 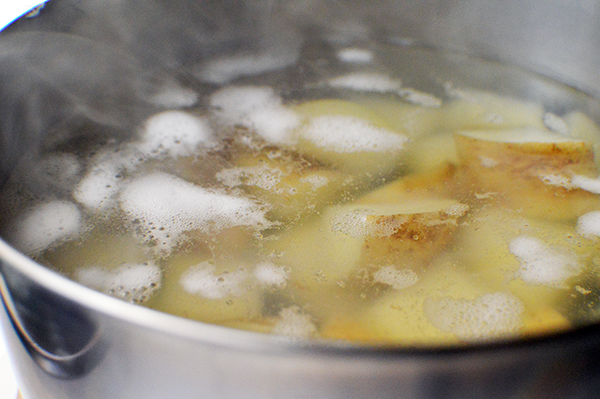 Bring the pot to a boil for about 15 minutes or until the potatoes are tender and fall apart when speared by a fork. Drain the potatoes and toss into bowl attachment for a stand mixer. 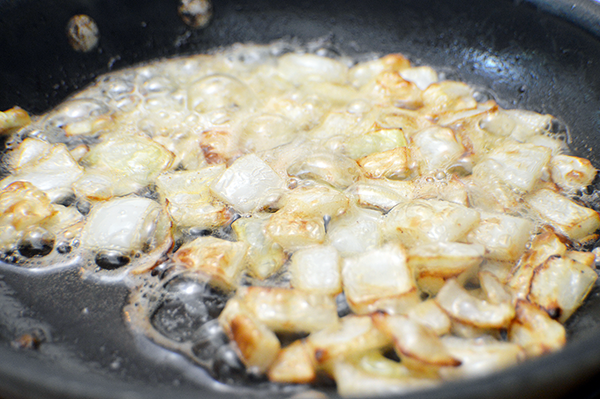 While the potatoes are cooking, prepare the onion gravy by chopping up the onions and adding them to a hot pan with a few tablespoons of butter. 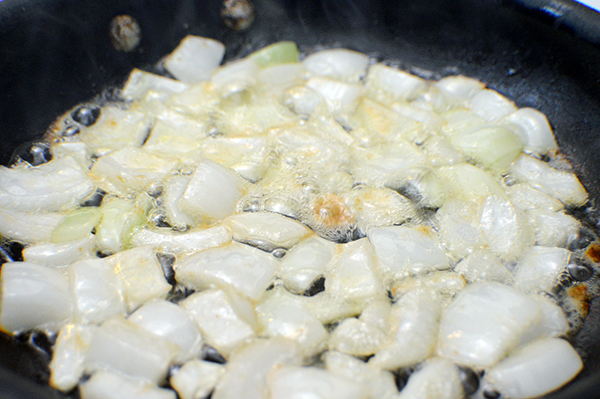 Stir the onions frequently, taking care to not let them brown too much or else they will become too crispy and won’t ‘melt’ into gravy. Continue to stir the onions, add in the flour, and scrape up any brown bits. Add the remaining 2 tablespoons of butter. Deglaze the pan with a tablespoon of white wine, then add the beef broth and crank up the heat to a rolling boil for a few minutes before turning down the heat and let the gravy reduce until it is nice and thick. 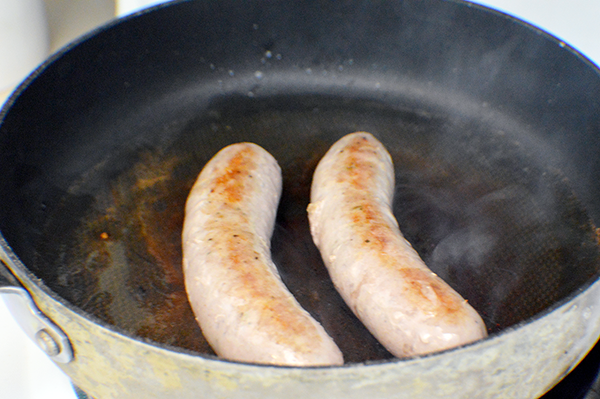 While the gravy is thickening up, start the sausages by adding them to a skillet with an inch or so of water. Cover and let the sausages steam for several minutes without touching them. When the water is all evaporated, add a tablespoon of butter to the pan and flip the sausages to bring the browning process. Keep an eye on the sausages as you make the mash. Use the stand mixer to beat the potatoes into a mash, then add the cream, butter, and milk until the potatoes reach the desired consistency. I prefer mine a little lumpy. 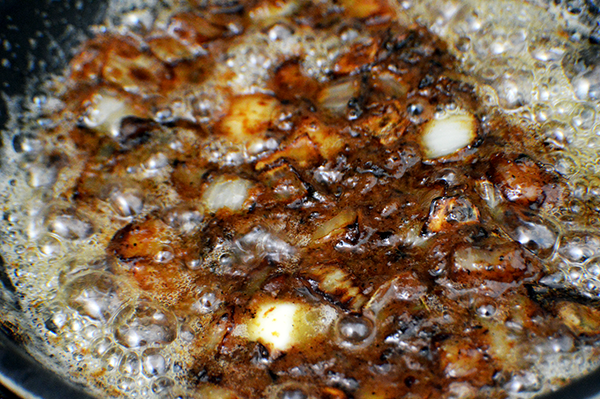 Be sure to not add too much milk or cream or else your potatoes will come out soupy and not…mashy. When your sausages are nearly done, start the bacon in a separate pan and fry until crispy. 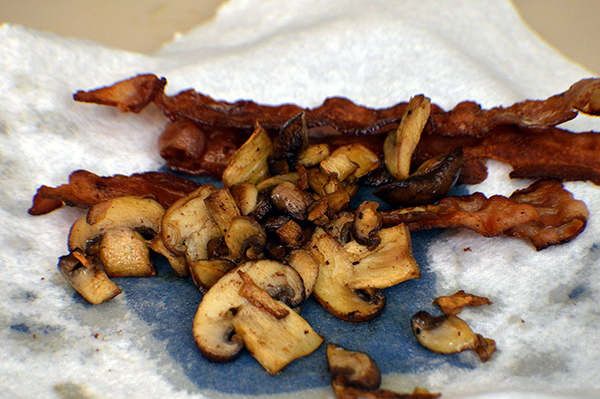 Use the leftover bacon grease to sauté any additional veggies – I chose to use some leftover mushrooms and tomato slices from my garden. Use the same pan to cook some eggs, sunny side up (or scrambled, if that’s how you prefer them!) Finally toast some bread or English muffins. 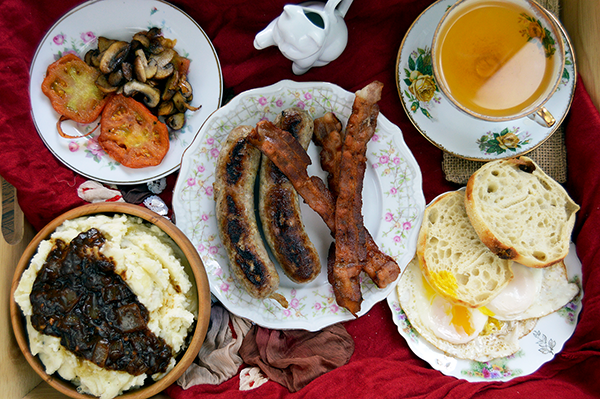 Serve up the bangers and mash alongside the rest of your breakfast goodies and a nice cup of tea and cream. Enjoy with your family of red heads (and friends). I think this meal would have made Molly Weasley proud. Wash and chop the potatoes. Cover with an inch of water in a large pot then bring to a boil for 15 minutes. Chop the onions and add to a pan with 2 tablespoons of butter. 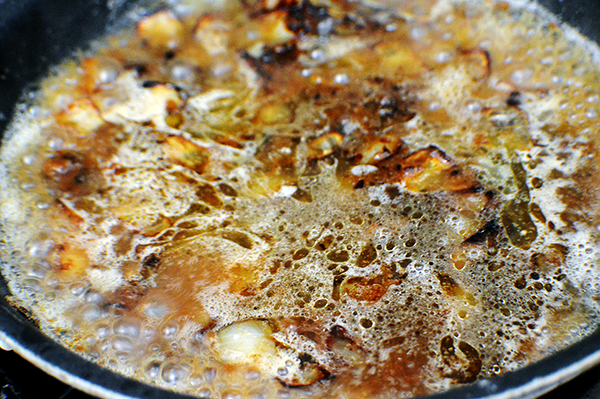 Stir frequently to avoid any sides browning too much. Cook for about 10 minutes. Drain the potatoes when they are easily broken apart with a fork. Add to a bowl attachment on a stand mixer. 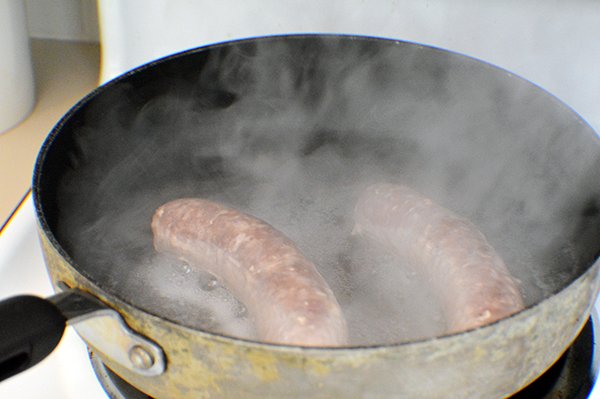 Use another skillet to prepare the sausages by first cooking the sausages in a ½ inch of water while covered. When the water has evaporated, add a tablespoon of butter and flip the sausages every few minutes to brown evenly on all sides. 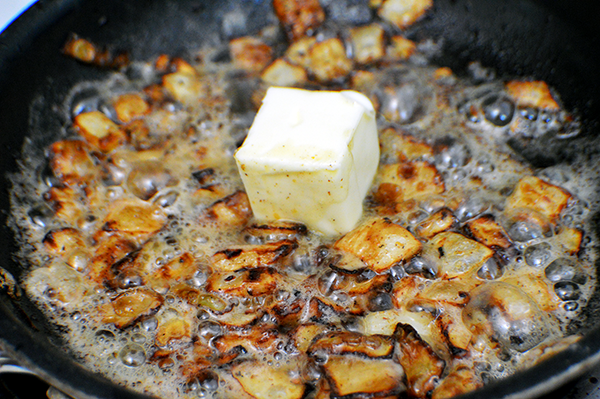 Add the flour and remaining tablespoons of butter to the onions and scrape up any browned bits. Pour in the white wine to deglaze the plan, followed by the beef broth. 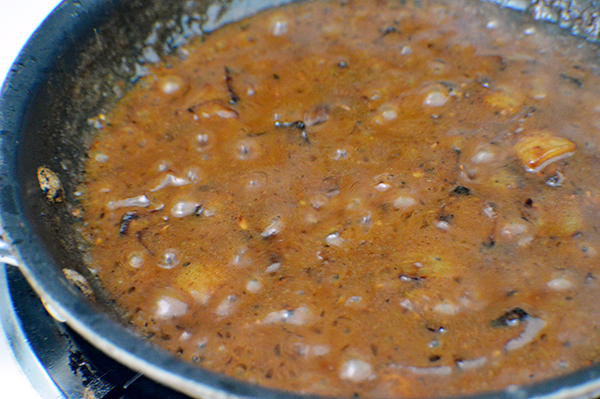 Bring to a rolling boil for 2-3 minutes before reducing the heat to let the gravy thicken. Stir occasionally. 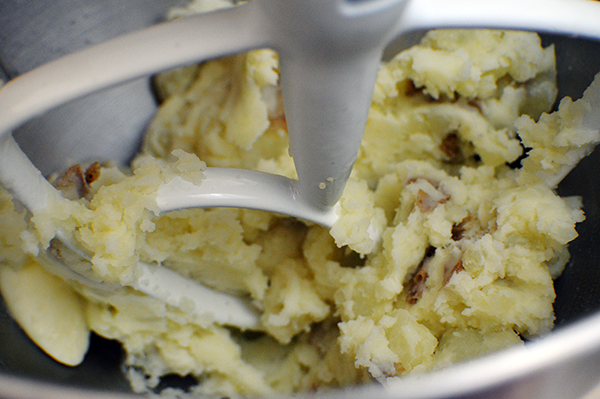 Beat the potatoes in the stand mixer while adding the butter and milk and cream. 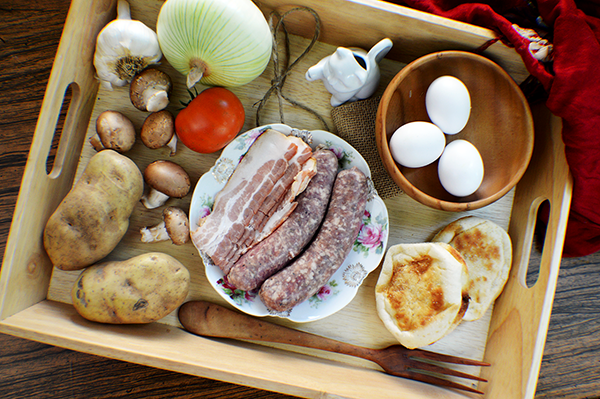 Serve alongside bacon, fried tomatoes, sautéed mushrooms, English muffins, and sunny side up eggs. Nothing brings family together like food – not even magic! Enjoy!